We invite you to explore India - the Land with infinite beauty ! Whether you soar high into Himalayas or peer under the ruins of the Ancient monuments dotting the landscape of India, you will cherish the experience long after your visit ! This India Travel Guide on Shirdi Temple is free from any commercial interest! This site is dedicated to promote India - the vast subcontinent, its glorious past, magnificent landscape and its infinite variety. Shirdi is located about 296 kilometers from Mumbai city in India. Shirdi is synonymous with its temple of Sai Baba, so much so that he is known as Shirdi Sai Baba. Shirdi temple is a beautiful shrine that was built over the Samadhi of Shri Saibaba, established in 1922. The temple also provides support to many a noble cause. The Sai Sansthan, just like its Baba who used to cure many diseases, has built a hospital, 'Shri Sainath' to continue providing services to the public. It was at the age of sixteen that Sai Baba arrived at the village of Shirdi in Ahmednagar district of Maharashtra. He remained here till his death. It was in the temple called Khandoba that Saibaba found shelter in this village. Mahalsapathi in the temple called him Sai or Saint Saibaba. Saibaba of Shirdi was an Indian guru who is regarded as an incarnation of Lord Shiva or Dattatreya to the Hindus and others believe that he was a Sadguru, There are several stories and eyewitnesses who recount miracles that he performed. Saibaba is said to have lived here between 1838 and 1918, although his real name, birthplace and date of birth are unknown. He was a young bearded man with sparkling eyes. He hardly spoke a word and stayed here. Gradually the villages offered him food and he never asked anything from them. He shared his food with animals and he expressed his view points with few elderly villagers. It was his simple language and special power of solving problems that led him to be known as Shri Saibaba. As time went by, devotees streamed to Shirdi and it started becoming a centre of pilgrimage. 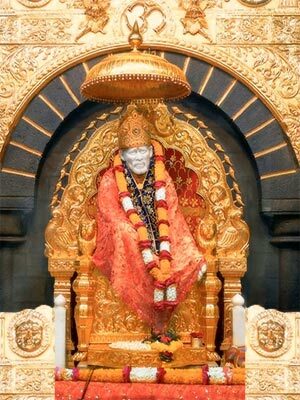 The philosophy of Saibaba is ingrained as 'Shraddha' meaning faith and 'Saburi' meaning compassion. Saibaba preached that Shraddha and Saburi were the supreme attributes to reach the state of godliness. Saibaba, was an Indian spiritual guru and a fakir. He was regarded with great reverence. He lived in a mosque; he was cremated in a temple after his demise. Saibaba never distinguished anyone on basis of caste, creed or religion. And that is perhaps why Shirdi, even today, is an abode for devotees from all religions. Saibaba's temple in Shirdi has become one of the most sacred, powerful and important places of worships for pilgrimage in India. There are several mandirs to visit in Shirdi. Gurusthan Mandir is the place where Baba appeared to the world as a young boy of sixteen. This place is Baba's Gurusthan, the famous Neem tree is here and it has a reference to Shri Sai Sat-charita. Devotees believe that their ailments get cured by burning incense here on Thursday and Friday. Sai Baba's Samadhi Mandir is the place where the Sacred Body of Baba is resting in Samadhi. Several articles used by Baba have been preserved and displayed in a room here. Pooja, abhisek and daily aratis are performed here. Shreemant Gopalrao, known as Butti Wada owned this place. He wanted to keep an idol of Muralidhar here and legend has it that Baba manifested himself as Muralidhar and the temple became the Samadhi Mandir of Baba. The Samadhi is built of white marble stones and the railings around are full of ornamental decorations. The idol of Baba, made of Italian marble built by late Balaji Vasant in 1954 can be seen here. The temple has an assembly hall for about 600 devotees. The life of Baba is depicted by pictures in the first floor of the temple. Dwarkamai Masjid is the place where Baba had stayed continuously for sixty years. The Shila, stone on which Baba used to sit is located nearby. Also the Sacred fire, Dhuni, lit by Baba is ever burning here. Baba used to give Sacred Udi, ash, to the devotees to solve their problems in life. Udi distributed to the devotees now is from this Dhuni. There are several oil paintings of Baba here. This is also the place where Baba used to cook food for distribution to his devotees. Chawdi Mandir hosts palanquin procession of Baba's photo and his holy Padukas and Satka are taken to this place on Thursdays. Lendi Baug has a garden made and watered daily by Baba himself, and this is named after the nullah or drain which used to flow here. It was customary for Baba to come here every morning and afternoon and take rest under a neem tree. Baba dug a pit about 2 feet deep under the tree and kept a light in that pit. An octagonal deepgriha, lighthouse, called Nanda Deep has been built in marble stone in memory of this place. It constantly burns in a glass box and one side of the deepgriha is a pipal tree and a neem tree on the other side. Nandapeep is kept constantly burning near the Pipal tree planted by Baba himself. Datta Mandir is the garden where Baba's Horse Shamkarna is buried. There is also a well here called Baba's Shivdi. The Samadhis of Shri Tatya Patil Kote, Shri Bhau Maharaj Kumbhar, Shri V.Padmanabha Iyer, Shri Nanawali and Shri Abdul Baba, all ardent devotees of Baba rest here. Three temples devoted to Lord Ganesh, Shani and Mahadev are located in the temple premises. Baba's Samadhi Mandir opens at 5 in the morning and a melodious prayer is played. At 5.15 am Kakad arati begins as a request for Lord Sai to wake up and give his merciful blessings to the devotees. A holy bath is offered with milk, honey, sugar, ghee and warm perfumed water to Baba. Thereafter offerings and presentations to Baba are accepted from 7.00 am. Mass abhisek starts at 8 am and noon arati is performed. In the evening at sunset Dhoop arati is performed and this time depends upon the inclination of the sun through different seasons. Devotional music is played. At 10 pm Shej arati is offered and Shri Sai Baba retires for the day. A mosquito net is put over the idol of Sai and a jug of water is kept on the dais near Samadhi. True to Saibaba's belief, Shirdi has become a place of worship for all religions. Also true to Baba's practice not to return anybody empty handed, even today he bestows them with 'prasad' (food) and his blessings for one and all.